FRIDAY, MAY 3, 10:00AM-5:30PM SATURDAY, MAY 4, 10:00AM-4:00PM ELMWOOD PARK • ROANOKE, VA Enjoy the festival Friday and Saturday! Friday Shortcakes-to-You Delivered to your home or office Saturday Kids Games • Arts & Crafts • Live Music Purchase Your Treats Online Now and Save! 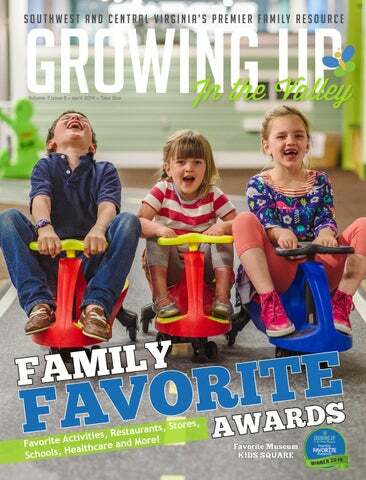 Leading Off This issue features all of the winners of our annual Family Favorite Awards! We pulled in more than 45,000 votes during the competition, and we’ve tabulated everything to come up with a list of winners in 52 categories. These winners are the absolute favorites of Roanoke Valley Families. This award means quite a bit for these local businesses, as the recommendation of a fellow parent goes a long way. Please take the time to check out the winners on page 30, and read about some of our featured winners like North Cross, which won in three categories: Favorite Private Elementary School, Favorite Private Middle School, and Favorite Private High School. We also have some big news: After 72 Issues as Growing Up In the Valley, we’re changing our name! We’ve published more than 750,000 copies of our magazine over the past eight years, and after all of that, we have officially GROWN UP. 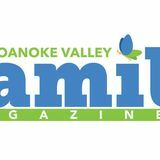 We’ll tell you more in the May issue— our first as Roanoke Valley Family Magazine! Until then, enjoy the beautiful weather, and thanks for your support! P.O. Box 4484, Roanoke, VA 24015 540-251-1660 www.roanoke.family Proud Members of the Parenting Media Association since 2013! Learn more at www.parentmedia.org. Evelyn and Anika getting ready to leave for Bolivia! We welcome reader comments, submissions, and the support of advertisers. We reserve the right to refuse or edit any materials submitted to us as we deem inappropriate for our audience. Please include a self-addressed, stamped envelope with any submission to be returned. We do not accept responsibility for unsolicited materials. Growing Up In the Valley and Growingupinthevalley.com are published by MoFat Publishing. Growing Up In the Valley is published monthly. The views and the opinions expressed by the writers and advertisers do not necessarily represent those of Growing Up In the Valley, its staff, or its contributors. While multiple businesses, schools, and organizations are represented in our pages, and magazines are often distributed to students according to the policies and procedures of each school district, this is not a publication coordinated or endorsed by any public or private school district, nor is it a publication with any religious or political objectives. As a mass media outlet, it is our oath and responsibility to communicate with due diligence, through our content, the plurality of views and opinions reflected in our audience of Central and Southwest Virginia. Readers are strongly encouraged to verify information with programs and businesses directly. Parents are urged to thoroughly research any decisions involving their children. Copyright 2019 by MoFat Publishing, LLC. All rights reserved. All material, including artwork, advertisements, and editorials, may not be reproduced without the expressed written consent of the publisher. Nolan Farnsworth, 9, Adrienne Farnsworth, 6, and Raelyn Farnsworth, 4 of Roanoke rolling around Kids Square Childrenâ&#x20AC;&#x2122;s Museum at Center in the Square. April 2019 30 Roanoke Family Favorites Discover the best local businesses for your family as voted by readers! You can be a healthy example of fitness for your children. Learn how to live with less. Disposing of unused drugs properly keeps them out of the wrong hands and our waterways. Children who begin drinking are more likely to abuse alcohol— learn how to protect your child. Shingles is more than an annoying rash. Do you know what questions to ask on your preschool tour? it’s all smiles at Kids Square Children’s MuseumRoanoke Family Favorite Winner! New Roanoke Hospitality House New lodging is in the works for families and caregivers of individuals receiving inpatient care at Roanoke medical centers. The Roanoke Hospitality House is a project in its infancy—still in need of a location—but, once established, will provide an affordable, comfortable place to stay. According to its website (currently a temporary Wix site at terriannejulian.wixsite. com/website), day guests will be able to use common areas for food, laundry, television, or computer use, and staff and volunteers will be on site to assist families and outpatients who stay at the House. twice during its lifetime, was completely demolished, and a new one built in its place. The new bridge is wider, includes bike lanes, and is lined with sidewalks. You can go to roanokeva. gov/2040/Franklin-Road-BridgeReplacement to watch an eight-minute time-lapse video of the entire process from beginning to end, taken from the Cambria Suites Roof Cam. Roanoke Valley Gives Success Roanoke Valley Gives 2019 was a huge success. On March 13th, people across the region donated a total of nearly $841,000 to Roanoke Valley nonprofits. The organization with the most money raised overall was Roanoke Catholic School, which received $125,665. Of the organizations classified as medium in size, Lake Christian Ministries raised the most, with $43,295. Of small-size nonprofits, the Prevention Council of Roanoke County was the top recipient, with $16,900. More than 160 organizations were represented on Roanoke Valley Gives day. If you missed it, it isn’t too late to donate to one of these organizations that exist to make our community a better place. Just go to rvgives.givebig.org, where you can browse causes by category, learn about the work each organization does, and make secure donations. The Roanoke Hospitality House’s founder, Terrianne Julian, seeks to team with Roanoke and surrounding communities to make the project a reality through sponsorships and donations of time and money. Information on how to get involved can be found on the House’s website. Twenty-First Century Farming Virginia Western Community College will be offering an associate’s degree in agriculture starting Fall 2019, according to the school’s website. The flexible, individually tailored program can be transferred to four-year college, “where students can pursue career paths such as extension work, agricultural education, agribusiness and veterinary medicine, for example.” Or, the program can be modified to include technical skills that would be beneficial in home agribusinesses. “The Roanoke Region has a robust agricultural history and we are excited to be offering this truly outstanding program to students,” said Dr. Robert H. Sandel, President of Virginia Western. By helping individuals develop the skills they need to succeed in a twenty-first century farming and agricultural landscape, he said, the program will have a lasting positive economic impact on the region. The website notes that Western will host a launch event for the new program, featuring guest speakers that include Virginia Secretary of Agriculture Bettina Ring and Delegate Terry L. Austin. options, job opportunities, shopping, dining, and entertainment choices, and chances to enjoy art and music, all within a short walk.” The benefits, the County says, are healthier lifestyles for residents, environmental responsibility, and having a center of knowledge and innovation. See the entire plan at roanokecountyva.gov, and then share your thoughts on the project by April 5th at surveymonkey.com/r/419survey. Songs like “Take A Chance on Me,” “Super Trouper,” “Dancing Queen”, and more! Many studies have shown that abused prescription drugs are accessed from family or friend’s medicine cabinets. That’s why, in 2005, the Drug Enforcement Administration created the National Prescription Drug Take Back Day across the country—to give people an opportunity to prevent drug addiction and overdose fatalities. In the Roanoke Valley, “National Take Back Day started about nine years ago as a joint effort between RAYSAC [Roanoke Area Youth Substance Abuse Coalition] and the Western Virginia Water Authority. It was a natural partnership, because we want to keep prescription drugs out of the wrong hands and out of our waterways,” said Tracey Coltrain, director of RAYSAC. The events are biannual, every April and October, the last Saturday of the month from ten a.m. to two p.m. There are now thirteen sites in the Roanoke Valley where citizens can return unused, unwanted, or expired drugs. Prescription Drug Take Back Day isn’t only about prescription drugs—you can also return over-the-counter medications like Tylenol or antacids. “It’s a great way to educate the public about the importance of not flushing your medicines down the toilet or throwing them away,” said Coltrain. At the event, drug disposal kits are handed out and families are taught how to safely dispose of the medication if they cannot wait for a takeback day. “We also teach people about the importance of having any prescription drug that is highly addictive or abused, like hydrocodone, OxyContin, or Xanax, and the importance of locking them up and not leaving them sitting out on a countertop or in a medicine cabinet,” said Coltrain. Pharmacies also provide safe disposal boxes for medicines. Take precautions for kids’ medications as well. “Some children are prescribed Adderall for ADHD, which is highly sought-after because it’s an upper—it can give you lots of energy and help you lose weight,” said Coltrain. Remember not to leave substances in your child’s possession, because it isn’t uncommon for another child to steal them and sell them at school. “If you’re a parent who is prescribed a painkiller or Xanax, your child is likely more aware of what they are and how they can be used to get high than you might think. So don’t leave your medication on the countertop, dresser, or medicine cabinet,” Coltrain said. Be sure to lock up your drugs, and be sure your child and his or her friends don’t have access. Remember also that there are other ways to get rid of medications besides boxes or take back days. “The last resort is to soak them in water and pour them in kitty litter or coffee grounds and throw them away that way,” said Coltrain. education about alternatives like massage, using heating pads or ice packs, or alternating between acetaminophen and ibuprofen,” Coltrain said. Unfortunately, our country isn’t doing well in terms of drug abuse. “The United States consumes ninety-seven percent of the world’s opioids,” Coltrain noted, “while other countries don’t use them, finding other ways of dealing with pain.” One fact about opioids is that using one substance can escalate into using harder ones. “Four out of five heroin addicts were actually prescribed an opioid by their doctor for wisdom tooth extraction or a sports injury, and that’s how they developed their addiction to heroin,” said Coltrain. It’s a good idea to invest in a lockbox for your medications, even if it’s just for Tylenol. “Pill abuse can start as young as the age of twelve, so it’s better to err on the side of caution—be responsible with your medications and keep them locked up,” Coltrain said. Also, Realtors need to keep their guards up. “There are people who go to open houses and pretend to look at the houses, but go into bathrooms to look through medicine cabinets,” said Coltrain. The elderly population, in particular, is targeted. Here in the Roanoke Valley, we are fortunate to have many community partners working together, as well as prevention coalitions, law enforcement, and even veterinarians and real estate agents helping to kick this problem. There are solutions everyone can participate in. You can easily get a coded lock box or pill pod—pill pods have a knob at the top with a four-number code, which is easy to use even for older clients, Coltrain pointed out. Always keep medications out of your child’s reach, and while you should try to attend a take back day this April, you are now empowered with even more safe strategies to dispose of unnecessary medications year-round. Young people who begin drinking before age 15 are four times more likely to develop alcohol dependence and are two and a half times more likely to become abusers of alcohol than those who begin drinking at age 21.
ome parents believe that while it isn’t a good idea for youth to drink, it’s not bad for them. However, this couldn’t be further from reality. “Especially in younger folks, we know that alcohol is one of the first drugs they start off with. We find that especially in Roanoke City, alcohol and marijuana are the two drugs of choice,” said Melanie Morris, director of the Roanoke Prevention Alliance at RAYSAC (Roanoke Area Youth Substance Abuse Coalition). The earlier you start the conversation about underage drinking, the better. “We know through research that if you start talking to your child about healthy behaviors, it can change the trajectory of how his or her life will go,” said Morris. the danger, in fact, is greater. When kids use substances at an early age, Morris explained, they can become addicted quicker since their brain is still developing. They are more susceptible.” The Centers for Disease Control and Prevention name shortterm health risks from drinking, including injuries, violence, alcohol poisoning, risky sexual behaviors, and miscarriage, as well as long-term health risks like high blood pressure, heart disease, stroke, liver disease, digestive problems, various cancers, learning and memory problems, mental health problems like depression and anxiety, social problems, and alcohol dependence or alcoholism. Kids face peer pressure and influence from their friends, so you want to make sure you know who your teen is spending time with, as well as who those kids’ parents are. Camp locations in Roanoke, Salem, Botetourt, and Lexington for children in preschool - 8th grade. (Ages vary by location) Early Bird Savings Ends April 30! seeing are the rise in e-cigarette usage and vaping, alcohol usage, and marijuana—with states legalizing it, the perception of harm decreases,” she said. Focus on building resiliency. “Children are sometimes affected with adverse childhood experiences, which can drive them towards using substances as a coping mechanism,” said Morris. You want to be sure your child is able to conquer adversity and be empowered, supported, and cheered on. Encourage your child to make better choices by letting her know she is good enough and is loved. That is how she will be able to overcome some things that have happened in her life that she may not have had control over. conversation. You may want to even roleplay situations to see how he may respond to instances of peer pressure. Try to coach him rather than control him. Once you have done so, encourage other parents to have the same talk. Last, but not least, don’t forget to be a good role model. Know that no matter what you’re doing, your child is watching and possibly planning to follow your lead when it comes to healthy decision-making. In the Neighborhood Cassy Childress loves teaching children. She’s been working to educate kids in the Roanoke area for the past sixteen years—fifteen of which have been spent with Roanoke City Public Schools. Cassy has taught in several capacities: At Breckinridge Middle School, she spent nine years as a sixth grade science teacher and taught English and math. Now, she serves as a kindergarten teacher at Fallon Park. More than anything, Cassy loves to see the smile on a child’s face when he or she learns to read for the first time. The “Voice of the American Teacher,” Robert John Meehan, said that a teacher who loves teaching teaches a child to love learning, and that’s a perfect description of Cassy Childress. “I truly love each and every kiddo I teach as if they were my own,” she said. “I’m blessed to have the opportunity to instill the joy of learning in each and every one of my students.” If she could give one piece of advice to a child about to enter kindergarten, it would be this: “Kindergarten is a magical experience—don’t be scared!” When she’s not teaching, Cassy, who was born and raised in Vinton, loves to spend time with her family. She and her husband, Jason, have two young children: Payten, who just turned eight, and Jackson, who is four. She enjoys watching both Payten and Jackson in their dance classes, loves anything that has to do with being outdoors, and is a huge Virginia Tech fan. Favorite Movie: Footloose You’d be surprised to learn Cassy worked in the automotive industry for twelve years, and has even built an engine! The winning teacher receives a $100 gift card from Grand Home Furnishings! Be Part of a miracle Earn up to $50,000 by giving the gift of life. The rewards are more than financial. We are seeking women ages 21-43, non-smokers with a healthy pregnancy history. 85% of a child’s core brain structure forms before the age of 5,* yet we invest only 4% in early education. The first 5 years of life represent the single greatest chance we have to impact a child’s future. Yet we spend the least on our children when they need it most. Investments in early childhood development help reduce teen pregnancies, improve dropout rates, lower crime, and produce a stronger, more productive future workforce. Our children are worth the investment. Help make sure our community makes early childhood development a priority. The first 5 years of life represent the single greatest chance we For more information, Beginnings have to impact aplease child’s contact: future. YetSmart we spend the leastGreater on our Roanoke sbroanoke@uwrv.org children when they| (540) need it283-2781 the most.| smartbeginningsroanoke.org Investments in early childhood development help reduce teen pregnancies, improve dropout rates, lower crime, and produce a stronger, more productive future workforce. said Cundiff. Unfortunately, in elderly patients, it tended to wear off over time. So the companies worked to develop a stronger vaccine called Shingrix, and currently, the demand for it is so great that the company can’t make enough of it. About one in six children in the United States is diagnosed with a developmental disability, ranging from mild impairments in speech or language to serious intellectual disabilities. In the past ten years, services have increased in number and in quality for kids with autism and other intellectual or developmental issues—and those services will continue to get better as we learn more about the disabilities and bring awareness to the public. It’s easy to forget, though, that kids with disabilities grow up, and as adults, they’re still in need of help. Many individuals on the autism spectrum both have the desire and the capability to work, to be involved in society, and to live independently. The problem arises when the rest of the community fails to realize their potential. “We serve a great community of people,” said Angie Leonard, CEO of St. Vincent’s Home Services in Roanoke and parent of an adult with autism. SVH Services is a broad and expansive nonprofit that meets the needs of individuals of all ages who have intellectual or developmental learning challenges. The historic organization has its roots as a boys’ orphanage founded in 1893; since then, it has evolved to care for a wide gamut of special-needs people. SVH Services is an umbrella for three organizations—one of these, BRAAC (the Blue Ridge Autism and Achievement Center) is well-known in the community, and the other two are newer: SVH Adult Services and SVH Family Services. Within these organizations are a plethora of support programs—if there is a need, SVH likely has a program to fill it. The programs help in areas like employment for adults with autism, assistance with independent living, daily living skill development, assistance with social activities, in-home support, special education day schools, a community hangout, after-the-diagnosis family training, and more. Right now, SVH Services assists about 250 families in the Roanoke Valley and surrounding areas, and nearly every program has a waiting list. it will go up to $30 per runner; the Fun Run is $15, and will increase to $20 after September 29). This fundraiser has been a huge hit the past two years; it includes a costume contest and, of course, donuts at the finish line. The proceeds benefit all three SVH Services organizations equally. In addition to Run for Donuts, SVH Services will be hosting the celebratory Light it up Blue for World Autism Day in Elmwood Park on April 2. Let’s show our support and our commitment to inclusivity by being willing to employ adults with unique needs, by making an effort to meet and understand those who are differently abled, by spreading the word about and donating to the programs SVH Services provides, and by hitting the pavement in the Run for Donuts 5K! Roanoke Valley Children’s Choir Newcomer Auditions May 2, 3, 4 at Bethel Baptist Church in Salem. Auditions are open for boys and girls ages 7-17. Singers should come prepared to sing the first verse of, “My Country Tis of Thee”. The audition is quick and fun and takes about 5 minutes. Come and be a part of the excellence and beauty of this award winning, Nationally Recognized youth choir. trashcan are near the door for those of us who prefer to use a towel to turn the doorknob. I could admonish Thompson Tires for the dim light, cobwebs, and whiff of smoke in their restroom, but I won’t, because their service is great, and they will tell you themselves that it’s better to drop your car off and come back for it later. The next day, I went to Haley Toyota near the intersection of Williamson Road and Orange Avenue to have a new key made. They needed access to my vehicle so that the computer in my engine could “talk” to the technology in the key fob. What I thought would take under an hour became a two-hour job—they were trying to save me money, so I won’t complain, but I did have to visit the restroom eventually. Haley’s lounge is large, and the restroom is down the hall from the children’s area. It’s clean and well lit, done in a neutral beige with a cheerful floral print on the wall. There are four stalls, and the handicapped-accessible stall is big enough to accommodate a mom with multiples! The soap and towels are in wall-mounted dispensers, but unfortunately, the trash is set in the wall across from the door. If you use a paper towel to open the door, you need to throw it six feet or so and hope it goes in. The verdict: Nobody wants to spend a chunk of their day waiting around for their vehicle, but both Thompson Tires and Haley Toyota made my wait comfortable by providing decent restrooms. How can a Mom with three small children also be a minimalist? That’s a question I asked myself two years ago when an acquaintance pitched the idea. Did I own way too much stuff? Yes—don’t we all? Was my chaotic clutter and lack of organization adding stress to my life? Absolutely! I was optimistic about the idea, but not overly confident in my ability to adapt to this lifestyle. After a few weeks of researching various online blogs and books, I realized that I could indeed tailor a minimalist lifestyle to work for my family. We could simplify and learn to live with less stuff while keeping the right balance to raise our children. The next four months were intense, to say the least. I decluttered every area of my home. My family was quite suspicious of what items I was discarding, but my husband did enjoy the income generated from selling items. In one weekend, we made three hundred dollars selling items we hadn’t used in years. not because they needed to change or loved them. I will admit that the sock situation was overwhelming. I did splurge in this area; I discarded all socks and started over with the kids. Each child now has a specific sock style easily identifiable to her—no more mismatched piles to work through week after week. This was a thirty dollar splurge that I highly recommend you take! Throwing away a pile of mismatched socks was one of the most satisfying feelings of the entire process. This journey inspired me to reach out to my social media friends and start a group for other parents intrigued by minimizing on a realistic level. The group is called Minimalist-ish Moms, and my first post included photos of my entire home. I offer tips, articles, advice, and support they can use to simplify their own homes. One thing I know without a doubt is that my family can live with so much less without even noticing. Minimalizing has transformed my life. I clean less, buy less, save more, and play more. I love being in my house. I’m continuously finding new inspiration for spaces and adopting a more modern decorating style. Have I relapsed? A little—there are times I can see the house accumulating new clutter. Minimalism is an ongoing process. Step one is removing the clutter, and step two is preventing it from returning. It’s a balancing act. When I shop, I have to ask myself all the time whether this item is something we really need and will use, or whether I can hold off buying it. Is this something I can borrow instead? One thing I know without a doubt is that my family can live with so much less without even noticing. My children love simplicity. When I come across an overwhelmed mom balancing everything, I know this is one area where I can help that will have a huge impact on her life. I simply ask: Have you considered becoming a Minimalist-ish Mom? June 3rd – August 9th 10 Different Summer Camp Themes! FIELD TRIPS EVERY WEEK! $75 Activity Fee Covers them all! Breakfast, Lunch, & Snack are all Included! No need to pack unless it’s a special day! Early Bird Special! Register before April 26th! varied and conflicted the answers can become. Advice is often disseminated according to the speaker/writer’s own experiences and observations, which may not fit perfectly in the new family. In truth, this is probably an age-old issue that’s renewed each time a new family is formed. What is a new parent to believe, which path should be followed? Several top baby carrier/sling companies had to close their businesses. After many years in perinatal education, I firmly believe that basic education in the form of birth and breastfeeding classes are most helpful in preparing new parents for their journey. If both parents start out on the same page with basic information, they will be better equiped to deal with all the new issues a baby brings. And, of course, the ever-discussed “bedsharing” continues to be a controversial topic. “Swaddling” was another popular subject that has survived for parents to use, or not, as they see fit. Some babies thrive using this method, others just efficiently kick out of the swaddle and do their own thing. So again, what are parents to do? In my opinion, such education is best done in a class setting. This can be online if one can find a well-designed class and is disciplined enough to stick to it. A traditional teacher/student setting is ideal, though, as questions can be discussed in depth as needed. The trend over the past few years shows fewer classes being offered in the traditional way, as exemplified by reduced number of classes offered at hospitals, perinatal groups, and midwives/doulas. In addition, the accepted “parenting style of the day” also influences the decisions new parents make. For an example, “babywearing” became a thing in the early 2000s. Almost immediately, baby carrying was the rage—until 2008, when one unfortunate incident in which an infant died in a carrier (and an inferior carrier at that) prompted government action. In 2010, the US Consumer Product Safety Commission issued a recall of the “bag style” sling involved in the death. Other incidences were investigated, resulting in a strong warning against sling carriers, which nearly wiped out the industry. One of the best-designed slings has never returned to the market. Thankfully, some companies have survived to sell slings and wraps today. Support groups abound online to advise new parents about use of these beneficial items. diagnose illnesses; midwives, lactation consultants, and doulas can share useful support information from their experiences. But what a new mom feels in her gut is important and often correct. That is what cues her to pick up her baby when he cries, feed him when he’s just finished a feeding twenty minutes earlier, and call the MD when things “just aren’t right.” In our “get it done NOW” society, knowing everything needed to care for a new baby cannot be so simple as just Googling it. Any relationship, adult or not, takes time to develop, and this is particularly true of knowing your newborn. As infants grow and change, the old adage, “Just when you get used to your child’s routine, it changes” is so true. It is also necessary, as growth means change and what you learn about your infant will grow into new insights and actions. If natural instincts are acknowleged, common sense is employed and baby is thought of and treated as a tiny human being (Does a friend need to tickle your feet or chin when you’re not eating your meal? ), then understanding of the child will grow and be just right for you and your family. All families differ; there isn’t a “one size fits all” answer to the journey. However, all families need encouragement to grow in confidence, and that’s something easily shared by us all. Vicki Honer is a 30+ year veteran childbirth educator and lactation consultant and owner of Lacation Connection, located at 3142 Brambleton Avenue in Roanoke, VA. She specializes in fitting nursing bras, teaching private birth and breastfeeding classes, and, especially, encouraging new parents. is followed by a Q&A session—led by local health professionals—that focuses on issues presented in the play. In the case of The Boy at the Edge of Everything, the issues are close to home for many teens (not to mention adults) today: Is it okay to have moments of nothing? Is there anything to be gained by being bored? How busy is too busy? What is a good balance when it comes to time? Since 2009, RCT4Teens has been presenting one issue-based play per year, both at venues like the Jefferson Center and at area schools. Pat Wilhelm, Roanoke Children’s Theatre artistic director, said, “The productions are a unique approach to connecting with teens about issues in their lives. And in the schools, especially, kids really open up in the Q-and-A workshops afterward.” The plays effectively communicate issues teens deal with in a way that’s relatable and low-pressure. Past shows have focused on texting and driving, eating disorders, teen pregnancy, substance abuse, depression, and other pertinent subjects. The next RCT4Teens show will be an original written by local playwright Samantha Macher, and will focus on internet safety, internet predators, and internet addiction. The production, The Fakes, is set to perform for the public at 7 p.m. on February 27 and 28, 2020, and will also be presented to all ninth grade classes in Roanoke City and Roanoke County public high schools. You can learn more about RCT4Teens at roanokechildrenstheatre.org/teens. Teachers The strength of any program is going to depend on the teacher. Requirements differ by state—while one may not require a bachelor’s degree, other states may. Find out what the qualifications are that the school itself requires of their teachers. What kind of certifications or experience do the teachers have? At a minimum, they should have a certificate such as the Child Development Associate (CDA) credential. Even better is a bachelor’s or master’s degree in early childhood education. Also find out if there are teacher’s assistants or aides in the classroom, as well, and if so, what their qualifications are. Many studies have shown that the lower the student-teacher ratio, the better the academic outcome. To ensure that children get the proper attention, states have strict guidelines in place for how many children a certified teacher can oversee and how many adults, such as aides and assistants, have to be in a classroom. Most early-childhood educators believe that younger children do best in classes with fewer than 15 students. Classroom setup and safety Preschool classrooms should have open floor plans with low tables, small chairs, and low shelves. Toys, books, blocks, and other items should be neatly organized into play centers and within reach of the children. Look around the classroom to make sure the room and materials are clean and the environment is safe. Stipek stated that “parents should look for general cleanliness as well as safety features like covered electrical sockets, toys without sharp edges, and safe storage of potentially dangerous materials, including paint and cleaning supplies.” Everyone on staff should be trained in CPR and first aid, and the school should also have an emergency plan in place. Also ask about background checks. Does the school perform those? Discipline Find out how children are disciplined and what kinds of rules they are expected to follow. How are children encouraged to follow these rules? Positive reinforcement should be used, such as reward charts or stickers, and praise from staff. If the child does not follow the rules, does the teacher use time-out, redirection, or some other kind of behavior modification techniques? Other things to ask: Do children take naps during the day, and if so, for how long? Who provides the food and snacks? Does a child have to be fully potty trained in order to attend? Can the school provide references or the ability to speak with other parents? Of course, cost is another factor that parents need to know up front. Some states provide free preschool, whereas many others still do not. However, there may be programs that help offset the cost for low-income families. Lastly, parents should follow their instincts. Does the school feel like a positive place to learn, do the children look happy, and are the teachers warm and inviting? Would they feel comfortable leaving their child there? If the answer to these questions is “yes,” they can then be secure in the fact that they have found the best place for their child. Four Camp Locations Near You! Discover the best businesses in the neighborhood — chosen by our readers! ONCE UPON A CHILD ELECTRIC ROAD The Once Upon A Child - Electric Road location has been locally owned by Renate and H.D. Kemp for more than 25 years. Mr. Kemp is actively involved in all of his stores, which include Once Upon A Child Christiansburg and Plato’s Closet Roanoke and Christiansburg. He is the best salesperson around and loves learning about his customers. Mr. Kemp’s top priority is to give hardworking parents quality items at prices they can afford and rave about. Kids Square Children’s Museum The Don and Barbara Smith Children’s Museum—Kids Square—exists to further Center in the Square’s mission to enhance education, economic development, and quality of life by providing a premier destination where curiosity is stimulated. Families are motivated to explore, play, and learn together in a hands-on learning environment. Kids’ Square serves as a necessary community resource that is well-funded and wellsupported by the community. The 15,000-square-foot museum is home to a kidsized town, a forest, a theater, a building zone, an 811 zone, a sensory cove, a blacklight exhibit, and more. Roanoke Valley Counseling Center Lasting positive changes are the primary focus of counseling at Roanoke Valley Counseling Center. We invite only the best therapists to join our firm, based on counselling excellence and career specializations. This allows our clients to learn, gain professional insight, experience personal growth, and bring joy back into their lives and relationships. With specialties in EMDR, trauma, anxiety, depression, Christian Counseling, electronic dependency, grief, loss, life-cycle issues, marriage, and relationship counseling, we have extensive experience in our chosen areas of expertise. Our commitment to excellence gives us the opportunity to pass that knowledge on to you and your loved ones. Call us today at (844) 782-2863. Physicians to Women Physicians to Women provides women’s health care to adolescents, women of reproductive age, and menopausal women in the Roanoke Valley. As the only privately owned Ob/Gyn practice in the area, we can provide you and your family the best health recommendations, regardless of hospital affiliation. Our office has on-site mammography, ultrasound, minor surgical, and laboratory services. Our board-eligible and certified physicians can help you by answering your individual care questions during the day and your emergencies at night. We recognize establishing and continuing care with a medical practice is an important decision and appreciate those who choose better health with us. VALLEY VIEW 1945 Valley View Blvd. North Cross Founded in 1944, North Cross School is an independent, nonsectarian, college-preparatory school located in Roanoke, Virginia, that serves children from early childhood through twelfth grade. North Cross provides a rigorous academic curriculum, competitive with the best college-preparatory schools in the Commonwealth of Virginia. While we explicitly recognize the importance of intellectual development and academic achievement, we also strive to promote personal integrity, empathy, and responsibility to self and community. Through this, our graduates will act as leaders in the local and global communities, persons of intellectual and moral courage, and scholars in the service of others. The School also houses the CrossWalk Program which, through the Orton-Gillingham approach, teaches students with diagnosed languagebased learning disabilities the necessary methods and strategies to thrive in their traditional classrooms. The School offers a boarding program, housed in the historic Boxley Building in downtown Roanoke, for its students in grades eight through twelve. Lenk Orthodontics Dr. Misty D. Lenk launched her own dental business from the ground up. Lenk Orthodontics provides care to patients of all ages, from seven to 70 years old. They provide all forms of orthodontic care from braces to aligners to fixed functional appliances. Dr. Lenk values her education and strives to continue the learning process to provide her patients with the most modern and proven types of orthodontic treatment. Member One Local, member-owned, and 120,000-members strong, Member One has been investing in southwest and central Virginia since 1940. The credit union provides financial tools for individuals and independent businesses at every stageâ&#x20AC;&#x201D;from checking accounts to mortgages, from personal loans to business loans, from credit cards to a full range of savings and investment options. In addition, Member One consistently supports the communities it serves with financial sponsorships and employee volunteer efforts. Dr. Lenk also dedicates between 60 and 80 hours every school year, giving back to the community in various ways. As a mom of four, she empathizes with struggles of our modern families. Her office strives to run and finish treatments on time, make treatment as affordable as possible, offer numerous payment plan options and provide individualized and gentle care. Her fun, family-friendly office is open to patients five days a week and it is a convenient location for people not only in Botetourt County but in all surrounding areas. With spring comes spring showers, but have you ever wondered how to measure the amount of rain that falls? With an adult’s help, remove the bottle cap and cut off the top of the bottle just below where it starts to get wide. Try catching more rain by changing the size of your funnel. Can you design something that will make your rain gauge collect more rain? Place a layer of pebbles in the bottom of the bottle. Pour water into the bottle until it reaches the top of the pebbles. The water and pebbles together will make sure that your rain gauge doesn’t blow over in the wind. Place the cut-off top of the bottle inside the bottom part, so that the top is upside down inside the bottle, forming a funnel. Tape it in place. (Since the edges can be sharp, you can also tape all around the edges.) Place a long piece of tape in a vertical line from the top edge of the bottle to the bottom. With the permanent marker, make a line on the tape at the top of the pebbles and water. Line up the ‘0’ of your ruler with the pebble/water mark and draw and label lines every centimeter on the masking tape line. This will create a ruler on the side of your bottle. What’s happening: Rain gauges measure the amount of rain that falls by collecting it over a small area throughout a specific amount of time. Meteorologists (scientists who study the weather) use one of a few different types of rain gauges. The one we have built is closest to a standard rain gauge. Standard rain gauges all use a very specific funnel size and collection container size, which lets scientists compare their measurements. If you alter the size of the container or the funnel, then two things can change: the height of the rainwater you measure and/or the amount of rain you collect. A lot of people want to collect rain over a large area because they harvest rainwater to reuse it. One inch of rain may not seem like much, but if it is collected over an entire roof, then the amount of water might be enough to fill a third of a swimming pool! Find somewhere outside that you can put your rain gauge where there are no trees hanging overhead. Double-check your rain gauge every so often to make sure the water hasn’t evaporated and still reaches all the way to your ‘0’ mark. Check your rain gauge after it rains and see how high the water is. That’s how much it has rained! Try comparing this with the weather report in the newspaper, on TV, or online to see how accurate your measurements were. To reset your rain gauge, pour out the water until it only reaches to your ‘0’ mark. s parents, what do we want for our children? While some parents might name specifics like getting a good education, acquiring job skills, and finding friends, most parents would say that, in general, they want their kids to be happy and healthy. We often focus on the happiness of our children—taking fun vacations, having them participate in sports and other extracurriculars they enjoy, and getting tutors for them when they’re struggling in school. But how many of us think about the healthy aspect of that phrase as much as the happy? As parents, it’s our job to teach and model good habits and behaviors for our children, and that includes health and fitness. Since being healthy also supports overall happiness, it is especially important that we cultivate these habits early. How do you involve kids in your health and fitness routines? “They need to build off what their parents are doing,” said Gordon. “Involve them in your own activities. Go for family hikes, take them to playgrounds. Find things to do with them.” At PlayFit StayFit, Gordon allows kids to workout alongside parents, and once they reach age ten, they can do classes on their own if they choose. “It’s a family atmosphere here,” he said. Goodpasture took it a step further, saying that while sometimes kids will want to do what you’re doing, just shoving them out the door and telling them to be active is not usually the best way to develop the habit. adults do. Goodpasture agreed that “kids can get away with eating stuff that adults can’t.” However, she encouraged asking yourself the question, “If I wouldn’t put it in my body, should the kids?” “Remember,” she said, “they are growing and need nourishment, so we need to instill good eating habits that last.” While the temptation is always around us, unhealthy foods are okay only from time to time. Goodpasture described the conversation we need to have with kids when we do go for those unhealthy options: “We are going to have this food as a treat today. We will enjoy it, but it’s a treat, and we only have treats occasionally.” Goodpasture encouraged making mindful, intentional decisions about health and wellness, especially when it comes to food. Since parents are in control of the food available at home, they need to provide opportunities to make good, intentional choices. She suggests keeping veggies cut up and readily accessible at all times, teaching portion control by using small containers for snacks, sitting at the table/counter to eat, and reading labels and nutrition guides on food packaging and deciding together whether or not to eat that particular food based on the contents. How can I improve this area of my life for my kids? Gordon’s experience is that as kids get older, they often get involved in more video games and screen time. “Go outside and play! It sounds simple. But kids need safe, unstructured play whenever possible.” Goodpasture emphasized that small changes and baby steps lead to success. “If you’re trying to get healthier, tell your kids! Place the emphasis on losing body fat and not weight, and let them know you’re doing this so you will be healthy and able to do more with them. If you make it a family affair, your kids will often hold you accountable!” Goodpasture summed it up this way: “We as parents are one of the top influencers of our children’s health. We are concerned about their well-being and want them to be actively healthy. Focus on one thing at a time, intentionally and mindfully instilling healthy thoughts and processes. Trust the process.” Parents, let’s advocate for our kids’ health as well as our own, and take the initiative to make wellness a priority for ourselves and our families. Our future, and the future of our children, depends on it! (edenenergymedicine.com). Lastly is the spirit. Emotions, self-esteem, and feeling connected to our “Wise One Within,” as I call it with my kids, all fall under spirit. Negative emotions and stressors, like worry, anxiety, fear, and generally feeling overwhelmed can build up in the body and create physical symptoms of disease. Clearing and releasing these from our body’s energy systems can help us feel connected to our higher selves. One of the best ways to help the body balance and clear those negative frequencies is through tapping, or the emotional freedom technique (EFT). If you’re new to tapping, check out thetappingsolution.com. The site has tons of amazing free resources, videos, and tapping scripts for the whole family, including a section just for kids and teens. I have taught both of my girls how to tap, and nothing warms my heart more than watching one of them start tapping on their own to help them overcome a difficult emotion or stressor. To give you an ideal jumping-off point, my staff and I at Unbridled Change have put together the “greatest hits” of our go-to activities for our kids and clients. We use the different practices and activities included in this free mini-series to teach regulation, how to overcome stress, and mindfulness and movement. For instant access to the free mini-series, simply sign up at unbridledchange.org. Sending you light and love on your journey to developing a holistic wellness routine for your family! TOP QUALITY PET FOOD & SUPPLIES, HOME DECOR, GARDEN, GIFTS, AND SO MUCH MORE! fur mom or dad? Try our newest adventure, Doggie Daycare at Nature’s Emporium! Call 540-772-1980 for more info! FRIDAY, MAY 3RD Tickets available at Ticketmaster.com, 1-800-745-3000, or the Salem Civic Center Box Office. 10 discount for groups of 10+ available at the Box Office. go.play.see. Jump into springtime fun! Theater & Live Shows Mamma Mia! who will we honor this year? Where is nightclub singer Doloris Van Cartier? Will the Holy Order of the Little Sisters of Our Mother of Perpetual Faith keep her safe from her mobster boyfriend Curtis Shank? Will the nuns be safe from Doloris? Or, will Doloris and the nuns be singing a new tune? You’ll love the music and your belly will hurt from laughing. Featuring a talented cast of North Cross’ high-school and middle-school students, we’re excited to offer this production for two nights! KIDS MAKE ART is a once-permonth, first-Saturday program offering opportunities for the whole family to connect with an art museum and respond creatively! By turning a viewing experience into a time for hands-on participation, children of all ages can enhance their observation skills and use their total brain, all while having fun working on a project with their parents, guardians, and peers! Local artist and educator Polly Branch designs and leads educational activities to bring you and your family together. Think outside the book. NORTH CROSS SCHOOL was founded on the belief that a classroom is a concept, not a room. With small groups, teachers are inspired and empowered to curate lessons, not follow them. Children pursue their best in a community that supports and respects curiosity and innovation. With programs designed to engage, question and surprise, every North Cross graduate is a product of our ceaseless evaluation of what works—and, a commitment to embrace what’s next. Voted Best Private School, Preschool, and Supplemental Learning Program in the Valley three years running. It’s not okay. Talk to your kids. Kids are less likely to use marijuana if they know their parents disapprove. Run the Blue Ridge Marathon on April 13! It’s the race for the rest of us! Do your stretches, eat your carbs, have your donuts and coffee and get ready for 500 yards of pure walking (well, we guess you can run—if that’s your thing)! Register at runsignup. com/Race/VA/Roanoke/ SpiritFMFamilyFunRun to get the full race experience: the bib, the pictures, the post-race snacks, AND it all goes to help Spirit FM continue to change lives! Everyone is a winner! Join us every month at the Famous Grandin Chillage Community Block Party! Enjoy local food trucks, live music, games, face painting, and more every month. New this year: in an effort to cut down on waste, we will be offering $2 off the price of admission when you bring your own steel pint cups, and will be offering our Grandin Chillage steel pints for only $8 at the gate. $5 Admission, 12 and under free, under 18 must be accompanied by an adult. Leashed, friendly pets welcome. So bring your chairs and your people, and let’s have a real good time! Cars and Coffee Roanoke is an informal social gathering for fellow automotive enthusiasts to meet and discuss everything automotive-related, while surrounded by the company of great vehicles, great people, and great coffee. All vehicles welcome—hot rods, roadsters, classics, muscle cars, exotics, luxury, rat rods, sports cars, tuners, cycles, and more. This is a cruise-in style event with no admission fee. It’s free to all vehicles and spectators! Invite your friends and bring your family—we look forward to seeing you! Valid only at Roanoke - Electric road and Christiansburg locations. Coupon can Not be copied and has no cash value. STEAM Ahead to Summer Fun. Kids College is our summer enrichment series which offers unique workshops for rising 2nd – 10th graders that are designed to teach new skills, develop new interests and hobbies, and explore future career opportunities. Star City Little Library Need a Book? Take a Book. Have a Book? Leave a Book. Little Libraries are a great way to spread literacy and entertainment throughout our communities. Every month Growing Up in the Valley will restock the little libraries with great books for your whole family and we welcome your donations as well! Stop by our locations to see what surprises we have in store, and maybe leave a gently used book for someone else to enjoy. Hey, Diddle Diddle, Humpty Dumpty, and Pat-a-Cake are quintessential for preschoolers and toddlers. Nursery rhyme books are plentiful, but The Neighborhood Mother Goose stands out from the crowd with Nina Crews’ absolutely gorgeous photographs of children and families playing together. The joy and love in the photographs are contagious and make sharing nursery rhymes with little ones even more meaningful. Few have captured the essence of childhood as well as A.A. Milne. His collection of poems, When We Were Very Young, speaks to what it’s really like to be a preschooler. The poem titled “Independence,” where a child bemoans constant safety warnings from adults, made my daughter shout, “YES! That is exactly how I feel!” With whimsy and keen insight, When We Were Very Young is sure to find a special place in your heart. A Light in the Attic is a must for any child’s poetry collection. The creative absurdity of Silverstein’s poems delights kids and adults alike, whether they’re about a dysfunctional homework machine, forgetting your pants, or a library book that’s forty-two years overdue. Silverstein illustrated his work with simple and wonderfully strange illustrations that further add to the fun. These listings are for informational purposes only and do not guarantee a discount. As restaurants change promotions often, we recommend calling ahead. PRE-K PASS Kids ages 3-5 enjoy free admission all season in 2019 with a FREE Pre-K Pass, which includes family favorites like Soak City, Great Pumpkin Fest and WinterFest. Register online at kingsdominion.com by May 27 and visit the park before June 23 to activate. Hunting for an Easter Egg Hunt beyond your imagination? Kids Square camps promise to offer a summer of fun! Campers will enjoy themed weeks such as Super Hero Camp, DIY Camp and much more. Participants will also enjoy water fun outside on the market, on our roof, or at the park, two days a week (weather permitting).